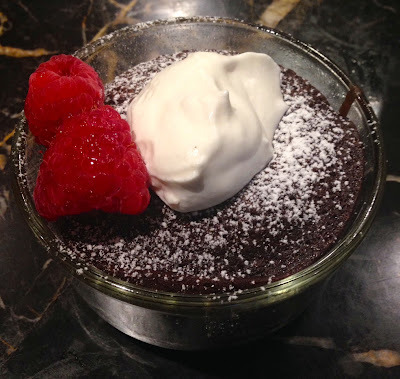 What is better than a chocolate lava cake? Well, a bunch of them! When my boys have their friends over, any recipes I make need to be delicious, simple to prepare and have enough servings to feed a small army. Unfortunately, with lava cakes, most of the recipes I could find were for a small number of servings...no more than 6 or 8. I needed to feed more like 16 or 18. 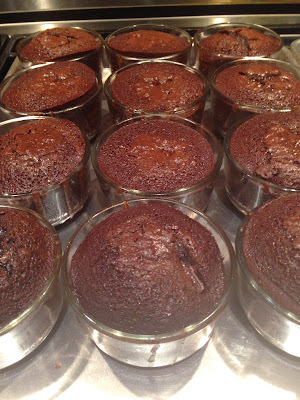 Most recipes for lava cakes get their molten chocolate center from undercooking the cakes. That worried me a bit. I did not want a recipe that I could easily overcook and lose the creamy, oozy center. After researching several recipes, I decided to start with a boxed brownie mix, for ease of preparation, and put squares of semi-sweet chocolate in the middle to ensure the ooziness of the center. My favorite brownie mix is Ghirardelli's Triple Chocolate variety. It is a darker chocolate than most boxed brownies and it has chocolate chips already added to the mix for extra decadence. Costco sells it in super large boxes with 6 bags of mix in each box. I keep one of these boxes in my pantry at all times, so I was already on my way to lava cake success. I pulled out 3 of the brownie mix bags from the box. My other ingredients included 9 eggs, 16 (one ounce) squares of semi sweet baking chocolate, 2 cups of vegetable oil, 3/4 c. water and 6 T. instant coffee. Thus armed, here's what to do. To begin, spray eighteen 1 cup ramekins with non-stick spray. Dump the brownie mixes, eggs, instant coffee, oil and water into a large bowl and mix until just moistened, about fifty strokes. Using a 1/3 measuring cup, scoop out the batter and pour it into each ramekin. 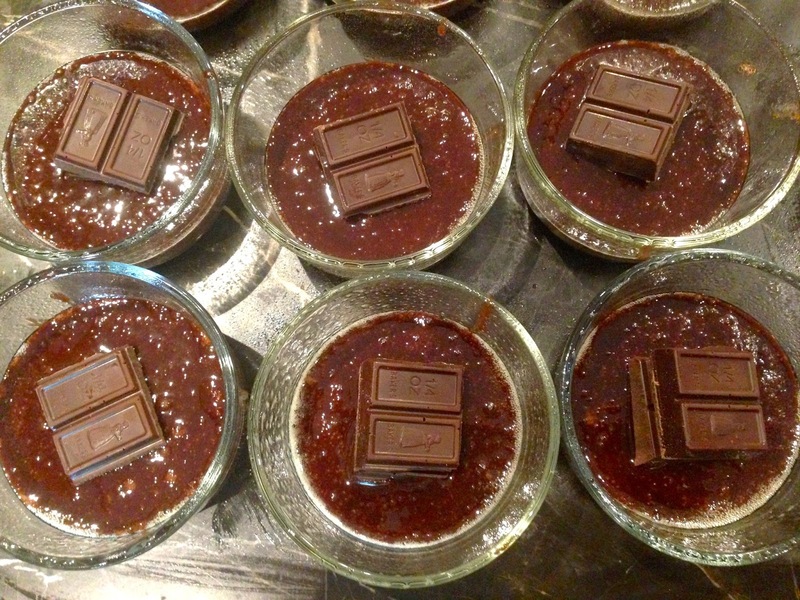 Place a 1 ounce square of baking chocolate on top of the batter in each cup. Then add another 1/3 of batter to cover the chocolate squares. Preheat oven to 350 degrees and place ramekins on baking sheet. Place the baking sheets of ramekins in the oven for thirty minutes. Do not over bake. Remove from oven and let cool slightly before sprinkling with powdered sugar. Garnish with raspberries and lightly sweetened whipping cream flavored with Chambord. Seriously, this could not have been easier and the boys loved the pretty little cakes. The next time you need to make dessert for a crowd, try these tasty little cakes. Preheat oven to 350 degrees. Spray 18 (one cup) ramekins with vegetable pray. Place the ramekins on a large cookie sheet. In a large bowl dump the 3 boxes of brownie mix, 9 eggs, 6 T. instant coffee, 2 c. oil and 3/4 c. water. Mix until just moistened, about 50 strokes. Pour 1/3 c. of mix into each ramekin. 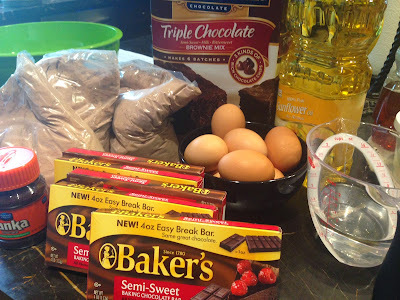 Place a one-ounce square of semi-sweet baking chocolate on top of the brownie mix. Pour another 1/3 c. of brownie mix on top to cover the chocolate squares. Bake for 30 minutes. Remove from oven and let cool slightly before sprinkling with powdered sugar. Serve with raspberries and raspberry flavored whipping cream.